The Hoochinoo Brave’s are proud to announce that on Friday 15th March they have the legendary CAPPO & DJ NAPPA (Phi Life Cypher) performing live at Vibe Bar, Brick Lane. Alongside them will be super crew PROBLEM CHILD, consisting of DABBLA (LDZ), DUBBLEDGE, SUMGii and iLLAMAN (TOMB CREW) with support from GRANVILLE SESSIONS (Full live band). 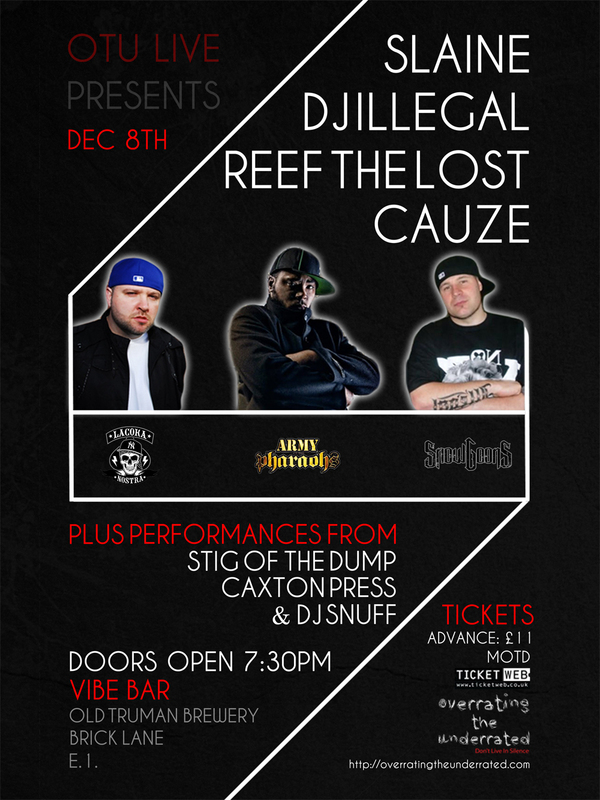 We are going to tear the roof off the place so come bear witness..
Hip Hop legends Cappo & Nappa have recently signed to King Underground Records as a duo and will be performing exclusive tracks taken from the forthcoming album, ‘Rebelbase’. Keep an eye out for the first single called ‘Red Hot’, which drops later in 2013. Problem child is a rap group consisting of dabbla, dubbledge , illaman and sumgii. Thats it. The music will do the talking. Granville Sessions are a fully live Hip Hop band out of London who have a wide range of influences. They are known for an impressive live show and have played with the likes of Congo Natty, Necro and Pharoahe Monch to name a few. Since dropping their debut release ‘No State’ in 2011 they have developed and progressed and they are now gearing up for the release of their first full length LP ‘Forward’ which will drop later this year. Granville deliver a healthy combination of nang rhyme styles,sample based productions and live instrumentation; a must-see for any discerning Hip Hop head.